Starting a podcast, even starting to think about starting a podcast is an exciting and interesting project. It’s also a critical phase that determines your ultimate podcast success. Starting a podcast is a growing trend – in fact according to Google Trends, search queries for ‘starting a podcast’ are up 250%. Are your competitors googling about podcasting too? So let’s turn the wondering into specific choices shall we? As with anything new, when you start your podcast project, you don’t know what you don’t know. You invariably start doing some internet research, googling and checking out resources on podcasting. And wow, can that be time consuming. Lots of articles about microphones and the steps to follow. Some free courses – quite a few are out of date of course. Some gurus over-hyped podcast programs. Detailed blog posts about how hard it’s going to be. Quick videos about how quick and easy podcasting is. Plenty of podcasts about podcasting. Where the hell do you even start with starting your podcast? Well, let’s narrow the field and consider starting a strategic business podcast. A podcast that is going to be part of your business, or that you are going to build a business around. 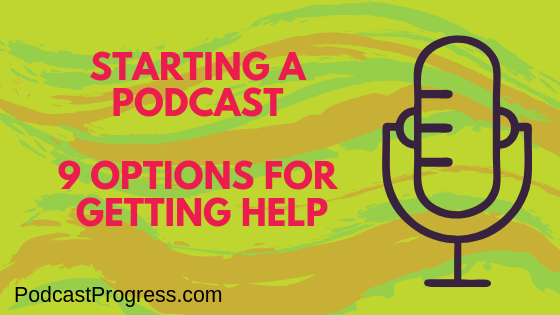 Here are some choices around getting help to start your podcast. There are some great options available to you. My intention here is to spark some questions for you, and help you make the most appropriate choice for you. Well there is certainly plenty of free stuff about podcasting on the internet. Some is quite old and out-of-date. There is some that is very good, but honestly, some is dreadful. It’s going to take a long time to sift through it, work out what you think is applicable to you. Then you will need to cobble together some kind of plan, and then get into the practicalities of creating stuff. Recording, editing, launching, marketing. The list goes on. It may all be ‘free’ but what is the COST in your time, and sanity. What else could you more usefully be doing instead? You could find a ‘how to podcast’ course. Again some of these have been around a while. Checkout what elements of strategy and planning are included – quite a few I have seen start with the assumption that you already have a strong idea for a podcast, and go through creation and launch steps without the upfront and essential strategy to establish your podcast foundations. Some have a strong technical focus. Again, question should you even be doing all this stuff – what else can you be doing that will move your business forward and generate revenue. P.S. I am currently developing a ‘how to podcast’ course to launch at start of 2019, which will include strategy as well as the technical stuff you need to know. Launch and marketing will also be included. 3. Join a Facebook Group. Plenty of those around. How many are in the group. Who is there to lead and mentor, guide and advise. Or is everyone left to hold each others’ hands, and support each other in a positive but ultimately meaningless way? Is it the blind leading the blind? Is the founder of the group ever in there? In many groups they are not – they have moved onto other things and spend barely any time. If it’s a massive group – well how much time and attention are you ever going to get. 4. Sign up to an expensive guru-led program. Hmm these are very often high on hype and low on personalisation. Again, use your reality filter to assess what you are going to get for your typical fee of several thousand dollars. Once again the essential strategy elements are not such a focus, because such aspects are difficult to address meaningfully in a large, time-starved group. You have to follow their strict timescale, and can soon fall behind and then stop doing anything. Or, feel inadequate ‘cos there are always those few ‘poster childs’ who seem to have it all figured out in advance and are quickly shouting about their success. Don’t be swayed with offers of ‘podcast kit in a box’ and ‘here is the kitchen sink’ done for you services. It could be a great option for you. But, Please be clear exactly what you are getting for all that money. Another popular option that gurus drone on about ad nauseum is the ‘outsource everything to a cheap VA’ route. Essential here is what exactly are you expecting that person to achieve for you. What is their experience level. You will be leading the project, telling them what to do, and how to do it. Not a great use of your time, and let’s be honest here, you still don’t know what you don’t know, and yet now here you are trying to organise someone else. This is unlikely to end well. 6. Hire a specialist podcast team. There are plenty of team based services around, where they will help you with your podcast. Fees and content vary wildly, and again please check out what levels of personalised strategy and support are available. For those cheap packages, of course they are outsourcing to lower cost resources too, but very few say that – they give you the impression those named experts and people highlighted on their site are going to be working with you. Beware the production line approach – it may not be suitable for you. This was the subject of my last blog post. There are plenty of internet radio companies which provide a ‘one stop shop’ way for you to get podcasting – on their platform. Again this could be an excellent way for you to get podcasting. They are not free or cheap. Their interest is typically in getting your show out there so it can start generating advertising revenue for them. Is that what you really want from your strategic business podcast? Your independence goes straight out of the window in these scenarios. And what happens when you want to leave and take your podcast with you? For the personalised attention that your strategic business podcast deserves then this type of help is most suitable. A couple of things to think about, however. Some people in this category have set up their own podcast by trial and error and then have decided they are going to offer their services to others who want to start a podcast. Good – they have some practical experience. However, look at their wider business and digital marketing skills and experience. For your podcast to do well and be a strategic aspect and asset of your business, you need wider knowledge than ‘just’ how to launch a podcast. There will be integration into your business model, marketing funnels, offers, email autoresponders, a podcast website possibly. Does the person you have found have those additional skills. Does the person you have found even have their own podcast – many do not. And if so, what is it like, how well does it do. Well you knew that was coming didn’t you? I have developed a clear, unique 3 step process to develop, launch & support your strategic business podcast. We start by investigating the 5 fundamental foundations of podcasting, and answer the basic question… is a podcast right for you and your business? If yes, then we move into the creation and launch project. With my background in corporate IT and love of training, you can be assured that your project is in my safe hands. No outsourcing – you get me. All is explained clearly. All is implemented and tested accurately and delivered on time. Yes I do have my own podcast called Stitchery Stories which is doing well. Yes I do have those wider digital marketing skills. I have been working online for 10 years providing a variety of digital marketing services, particularly video marketing and content creation, and podcasting services. I have good WordPress skills. Additionally, I am a technical trainer with VAClassroom.com a major online training company, as well as being one of their 7 global mentors, supporting their students. And I have spoken at several online conferences on podcasting and content marketing. And please connect, and let’s chat. It all boils down to what resources you want to invest in your podcast – time, energy, money. And, how easy, stress-free, enjoyable and successful you want your podcast to be. At least by spending a few minutes reading this, you understand your choices, and can move forward confident that you can make the appropriate choice for your situation and podcast goals.